To Live is Christ: The Life and Ministry of Paul - Bible Study Book by Beth Moore provides a personal study experience five days a week plus viewer guides for the group video sessions of this in-depth women's Bible study on the life and ministry of Paul, the Apostle to the Gentiles. Paul served faithfully, loved heartily, and demonstrated what it means to die daily, crucified with Jesus Christ. Join Beth Moore in a journey to discover a greater appreciation for his unflagging faith and undying devotion to servanthood. You are also welcome to just come and watch the videos with us! Wednesdays at 6:30-7:30pm starting September 19th. What's the most courageous thing you've ever done? It's Dennis Rainey's favorite question for men. Men face decisions in life that demand courage. Big or little, complex or straightforward, these choices-let's call them battles-matter a great deal. One courageous choice leads to another; tomorrow's integrity depends on today's bravery. 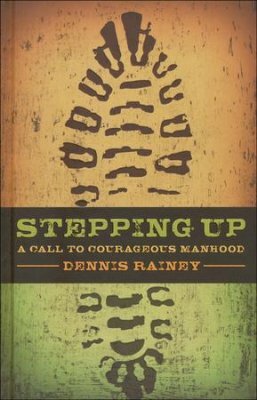 Author, speaker, and radio host Dennis Rainey offers a simple yet powerful vision for what it means to be a man who truly conquers, and truly wins. Using personal stories and biblical principles, Rainey indentifies five stages of a man's journey through life and examines his responsibilities at each step. He calls men to step up to courageous manhood. Led by Brent Kendall and Neal Blank. Last year, we embarked upon a study of the last week of Jesus’ life. It involved an examination of what happened between Palm Sunday and the Garden in Gethsemane. Next Sunday, I plan to complete the study - Jesus’ arrest through Easter Sunday (did you know there is a connection between the prophecy of Daniel and Jesus’ Passion?). We will use Mark’s gospel as our starting point. The program will begin with a light lunch after the late service (about 12:30PM) and will finish before 2:00PM. The purpose is to not merely recount the events of the last few days of Jesus’ life, or to look at the economic, social and political climate that contributed to the events, but also to touch on the great theological issues that surround the trial, crucifixion, burial and resurrection. For example, what is the significance of the Saturday between Good Friday and Easter Sunday? Come and join us on Sundays, March 5, 19 and 26 as we look at THE most important series of events in human history (I call it “The Day the Revolution Began”). If you are interested in attending, please call Holley (432-4593) in order that we will have enough food for lunch. I look forward to seeing you as we explore God’s Word together.